Filling and inexpensive, ramen has garnered a cult following in east Asia and the US. But only relatively recently have appetites for milky broths and springy noodles made made their way to London. Here are a few of the restaurants who are making sure these cravings don’t go unchecked. A graduate of ramen school in Japan, Kanada Kazuhiro set up his first restaurant in Yukuhashi two decades ago. In 2014, he opened his first London outpost, dedicated to exporting a ramen recipe largely of his own creation ­– the Tonkotsu X, a chicken and pork hybrid bone broth with pork belly, wood ear fungus, and seaweed. Clearly, it hits the spot ­– they open their third site, on Upper Street, next month. It wasn’t that long ago that Japanese food carried certain connotations. Conveyor belt sushi bars, £300-a-head restaurants, and an affinity for dining on poisonous fish. So when Ross Shonhan hung up his Zuma whites, he wanted to change that. What resulted was Bone Daddies, a restaurant (now restaurants) harbouring the kind of rock n’ roll vibes reflective of Shonhan’s Japanese soul food philosophy. Almost 50 years ago, Masatoshi Ogata built a ramen shop from bits of reclaimed wood. Last October, and after a successful pop up residency at Shuang Shuang, he set up his first permanent restaurant in the UK. As part of a brand well-established in Asia, Yamagoya have come a long way, but they don’t like to boast: here the focus is on little else but perfect noodles-and-broth. 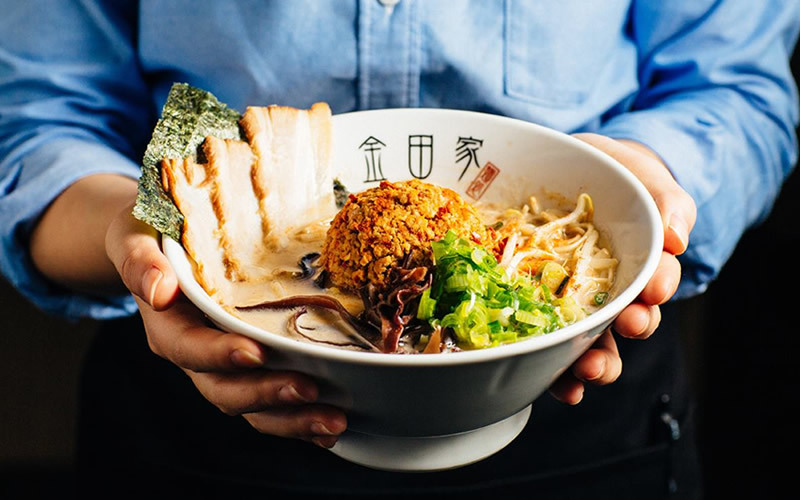 ‘The best ramen I’ve eaten in the UK’, says Tim Hayward. 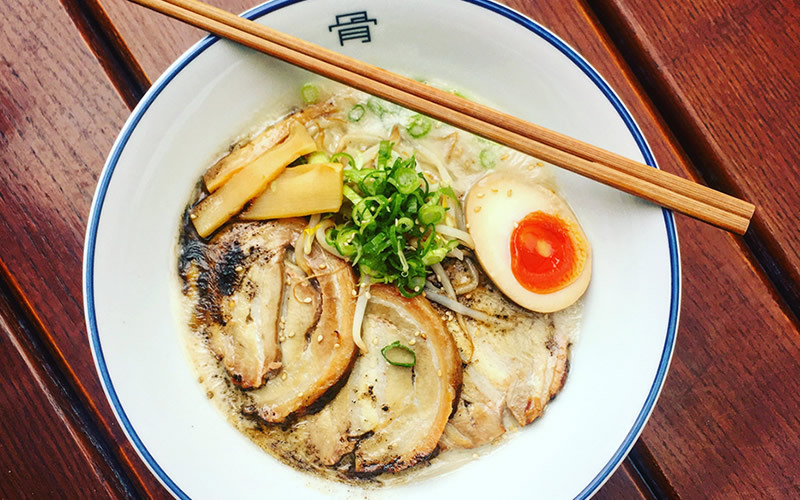 If there could only be one example to the school of thought that ramen has no rulebook and is whatever you make it, then consider Tim Anderson’s restaurant in a former pub in Brixton. Perhaps you don’t care much for authenticity. But for the puritans, look away now – lobster claw and brioche toppings, ample Scotch bonnet heat, and curry goat ramen, all feature on Nanban’s menu. 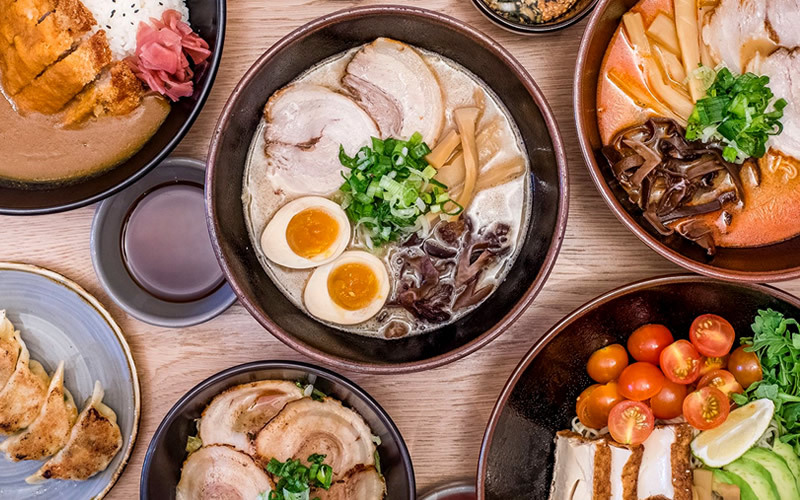 Tonkotsu, meaning ‘pork bones’ in Japanese, is such an iconic dish in East Asia that experienced restaurateurs Emma Reynolds and Ken Yamada decided to name a joint after it. Noodles are made freshly and rather painstakingly in-house, and in keeping with the Japanese drinking den theme, beer is the drink du jour (though saké also features extensively). Tonkotsu’s fourth branch has just opened in Battersea and you can book a table at their Bankside branch on OpenTable. Looking for the authentic down ‘n’ dirty ramen experience? Pop Brixton is where you can find it. Served cheap, exceedingly hot, and not in any formal surrounds, Koi’s interpretation represents the true spirit of ramen food stalls in Fukuoka (where tonkotsu originated). Ramen at Koi is served in ‘cups’ more akin to small buckets, so be sure to go hungry. Surely you are missing Ippudo? Yes, how come they miss ippudo? What about Shoyru? Went to bone daddy’s today….. Yuzu tonkotsu average and broth overseasoned. Shoryu average at best I’d say. Over priced and insipid to my mind. Tonkotsu and Kanada Ya pick of the central locations. Bone Daddies on Peter Street, the original and best one of theirs. Tonkotsu has dropped in quality massively in the last couple of years. Smaller meat cuts, and broth doesn’t taste as good. Shame as it used to be very good. Ippudo is a glaring omission from this list. Koi also have a branch in Tooting, I have their ramen delivered on probably a weekly basis. Wholeheartedly agree with their inclusion on this list! Ramen is supposed to be a cheap dish and treated like the equivalent of kebab (after night out food) in Japan. Sad to see too many over priced places! Monoon, at Old street is the real Ramen restaurant, not bar. Ramen bar is quite interesting word because Ramen should be eaten in timely manner and it doesn’t fit to drinking, indeed. Anyway, Tonkotsu is not the one which should be listed here….